Vitra, the furniture company, have turned to a variety of major architects to design the buildings making up their manufacturing site near Basel, close to the German/Swiss/French border. As well as Frank Gehry, Alvaro Siza, Nicholas Grimshaw, Tadao Ando and Zaha Hadid are all represented, in a cross between an industrial plant and a model village. The design museum houses temporary exhibitions on themes of furniture design, and Gehry's building makes a suitable host for them - in keeping with the theme, but - once inside - supporting, not competing with, the exhibitions. 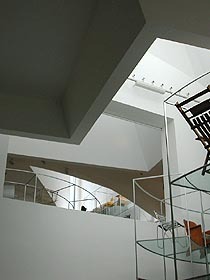 The geometry of the building does not feel contrived, or particularly noticeable, as you go around the exhibitions. From the outside it does feel both those things, but it is at home among the other architectural showpieces that make up the Vitra site. 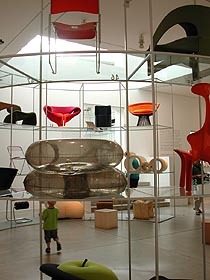 The design museum is open Tuesdays to Sundays. It is closed on Mondays, and also during preparations between its temporary exhibitions - so check first: call +49 7621 702 3200, email info@design-museum.de or visit www.design-museum.de (select Vitra Design Museum, not the one in Berlin). 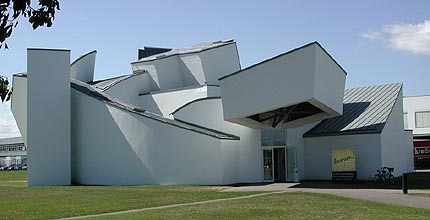 Vitra also provide 2-hour guided architectural tours (in German) of the other buildings on their site. For groups, you can arrange in advance private tours in German, English, French or Italian - call the number above. The museum is in Germany, but the closest city is Basel in Switzerland. By car, from Frieburg (North) or Basel (South) take the autobahn A5 (exit Weil am Rhein, then signposted). From France/St Louis take the border crossing Palmrain. From Lörrach/Riehen turn west at the junction marked 'Weil am Rhein' just North of the Fondation Beyeler. By public transport from Basel, take bus number 55 which stops right outside the museum at the entrance to the Vitra site. Or from the train station in Weil am Rhein it is a 15-minute walk. 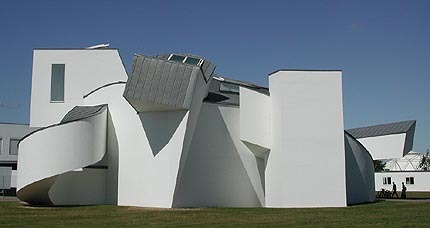 Illustrations and brief information (in English) about the architecture at the Vitra site is provided at Vitra's web site.